Austria, Salzburg.Ernst Von Bayern, 1540 to 1554. Silver Zweier. Dated 1551. Denomination : Silver 1/2 Kreuzer. Mint : Salzburg. Size : 14.2 x 16.0 mm. Weight : 0.65 grams. Grade : VF for wear but weakly stuck around the edges. The reverse was struck blank, but there is an odd corrosion that creates white patches on the reverse. 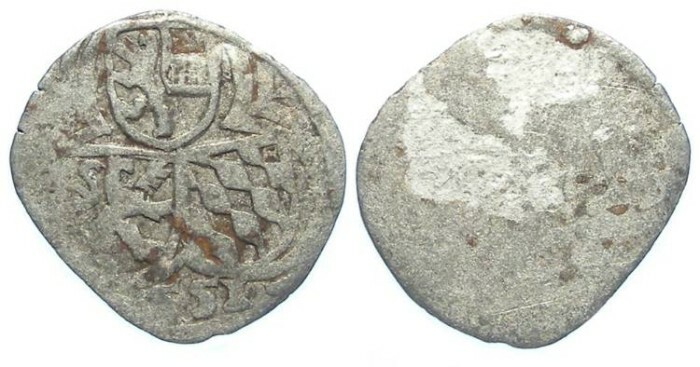 Obverse : Tri-lobed arms with the date 1551 but the leading 1 did not struck up properly.